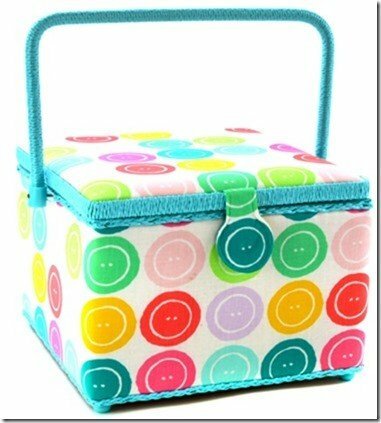 Dritz St. Jane Sewing Baskets are a must for storing your sewing supplies functionally and fashionably! Baskets in this collection feature a pocket and pin cushion attached on the inside lid. Basket handles, trim and lining are all color coordinated. There is a lift-out tray for organizing small sewing items. A sturdy magnetic snap closure keeps the basket closed in transit. Size: 12" x 6 3/8" x 7 1/8". Large oval. Metal handle. Sewing notion fun fabric on a white background.